I have been looking forward to getting into San Gimignano ever since I started the novel about a year ago. It felt amazing to finally walk through the gate and look up the main drag to see one tower, and then another a few paces on and then another and another. I spent a lot of time pointing my camera up to get the classic tower against Tuscan blue sky look. I was planning to walk to San Gimignano from the hotel but fortunately a nice Dutch couple who is staying here stopped and gave me a lift. Good thing since some of the walk is along the edge of a very busy road. They dropped me at one of the two gates into the town and off I went. Just as I remembered, San Gimignano is heaving with tourists – wall to wall people streaming up the street and into the two main piazzas. During the main part of the day I saw lots of tour groups but by the afternoon I saw far more locals starting to come into the town as the tourists left. My first stop was San Gimignano 1300 — a brand new attraction created by two artists who built a scale model of how San Gimignano looked in 1300 when it sprouted 72 towers (just 14 remain). The place is made to order for my research. I couldn’t ask for a better attraction. It was surprisingly difficult to find — off the main drag on a street that was completely empty of tourists. 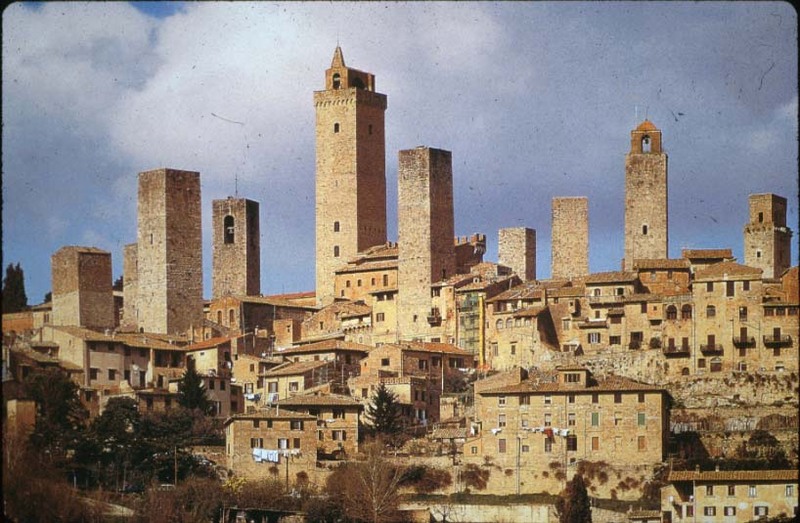 That’s the thing with San Gimignano – the main street is packed but if you walk right or left down one of the side streets you may as well be in the 14th Century. You’ll see the odd local, a few cats, and that’s about it. Anyway, I found San Gimignano 1300 finally and after paying my 5 euros (what a bargain!) I was met by a lovely young girl dressed in period costume. I couldn’t believe it – I was there for at least 45 minutes, maybe longer and the whole time not one other soul came in. I mean it’s the most amazing attraction – the artistry of the scale model is breathtaking as are all the displays of what life was like in the 14th Century. The museum is housed in the base of what used to be a tower and has been beautifully renovated. The ground floor contains the scale model and the upper floor contains rather a lovely modern art gallery featuring local artists. The young woman was an amazing font of information. She started off sticking with the tour but since I was her only customer she was soon answering all my many questions. I finally told her I was researching a book set in the 14th Century and so by the end of the tour the other two women at the museum also knew. They took my email address and gave me a card for the museum with exhortations to email them any time with questions. I took tons of pictures and bought a very cool bowl made by one of the artists who created the model. 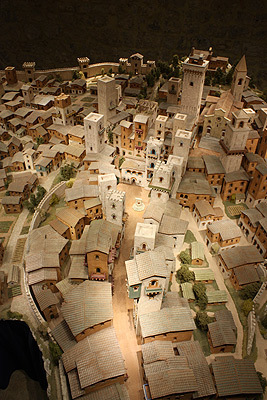 I just could not believe that with all the people clogging the streets of San Gimignano, not one person made it to the museum while I was there. When I left, I saw a man looking at the sign outside. I told him he should go in, that it was the most amazing display but he figured it was “just a model” and declined. More the loser him! On the other hand, San Gimignano has two torture museums – both of which looked pretty crowded. What does that say? I don’t want to think about it. After my ecstastic experience at San Gimignano 1300, I stopped into il Quattro Catti for lunch — a lovely small Osteria that the Hungarian guys had told me about last night. The place was crowded with Italians out for Sunday lunch. I had a glass of the white Vernaccia wine – the specialty of San Gimignano. It was very clean and crisp with a slight green tinge. Very interesting! The restaurant was pretty upscale with food to match. I had the special – a plate of very nicely arranged Antipasti and then one of three pastas. I chose the Penne e cosa peco (or something like that). Basically it was penne pasta with cheese and pepper. I knew from previous trips to Italy that that seemingly plain combination can be dynamite if done right. Yes, well, it was done right! I ate every scrap of the creamy, cheesy, peppery, ultra rich concoction. My waistline is already in serious jeopardy. But how can you eat diet food in Italy? It’s not natural. After lunch I wandered up to the Rocca for an amazing panoramic (and free) view of the towers and the surrounding countryside. I set a scene in the novel up there so I was glad to see that it looked pretty much as I’d envisioned it. I also went into both the Duomo and the Museum to check out some famous frescoes. My 14th Century character’s father is an artist who paints frescoes so seeing the real thing in situ was very instructive. I find it amazing how clear and colorful the frescoes still are. I imagine they have been cleaned fairly recently. I even climbed the Torre Magre – the biggest tower. It’s a long hike up with a very precipitous climb up basically a ladder at the end (not fun coming down!). However, the view at the top was predictably awesome. I had intended to hang out in San Gimignano until darkness fell and the crowds dissipated but the weather has suddenly remembered it’s October. The wind came up, the temperature dropped and even though I bought a scarf at one of the stalls in the main piazza, I knew I’d be freezing by nighttime in my very thin sweater. So I walked the 2 km back to the Villa Ducci and managed to get some great late afternoon strong shadow photos of the vineyards and surrounding hills. Time now for dinner back at the hotel. Unfortunately, the food here is not the best but I had a fabulous lunch so I can’t complain.